In the direct response television industry, creative success is measured each and every day. Advertisers are constantly investing in new creative in hopes of increasing their television advertising ROI and KPIs. Many DR advertisers use creative variations (different 800 numbers and/or web promotion codes) to accurately track both creative and media performance. Adsphere™ is the first television research system that allows you to segment and study campaigns that use DR variations. Measured DR creatives that don’t perform well are quickly discontinued to the favor of better performing creatives. This intelligence is unlocked in AdSphere™ creating valuable insights as to both creative and media performance for 8,151 brands. AdSphere™ is purpose built using advanced pattern recognition along with automated content recognition (ACR) technology to identify direct response (DR) attributes in television programming such as toll free numbers, price points, web addresses, and more. When a DR attribute is discovered, AdSphere™ compares the surrounding video & audio wave pattern against existing creatives in its expansive database. When no fingerprint match is found, this is how AdSphere™ knows it has discovered a new DR creative test. These new DR candidates are promptly assigned to an AdSphere™ researcher for registration. DRMetrix created Adsphere™ as the first television research system designed to identify all new brand/direct and direct response creative tests. Once identified, all airings of these creatives are tracked using state-of-the-art automated content recognition (ACR) across 120 networks monitored by AdSphere™. The end result is the industry’s most comprehensive database of DR creative with complete airing detail. To date, AdSphere™ has discovered and tracked airings for 33,934 unique creatives across all ad formats including short, 5 min, and 28.5 minute infomercials. As a creative professional, you have access to review all of these creative tests with insight into which have been successful and which have not. Imagine being able to research any industry category and quickly determine the most effective creative approaches used to date while also knowing which approaches to avoid. All of this and more is possible thanks to AdSphere™. A world of creative insights await you as you explore AdSphere™airing frequency timelines at the creative level to determine whether a creative is at the beginning or end of its life cycle. Find any advertiser or brand in seconds and gain access to all current and historical creatives. 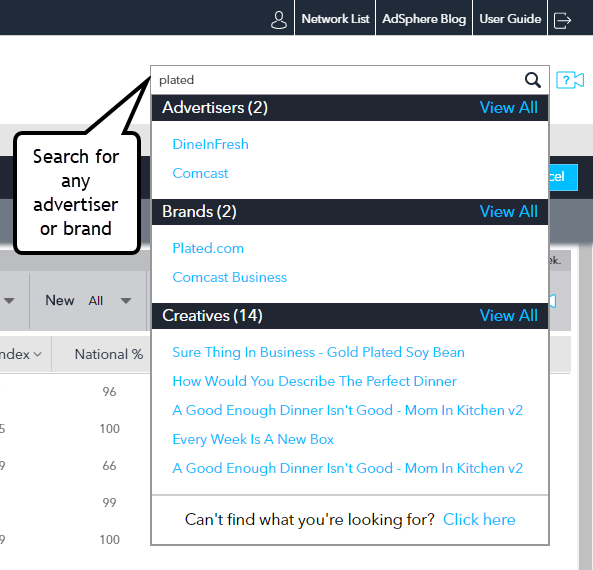 For business development, AdSphere™ has built the industry’s largest advertiser contact database complete with phone, email, and social media links. It’s easier than ever before to identify, qualify, and contact these valuable targeted prospects. Please allow us to share AdSphere™ with you and your team. To schedule a screen share demonstration, and free trial, please click here.